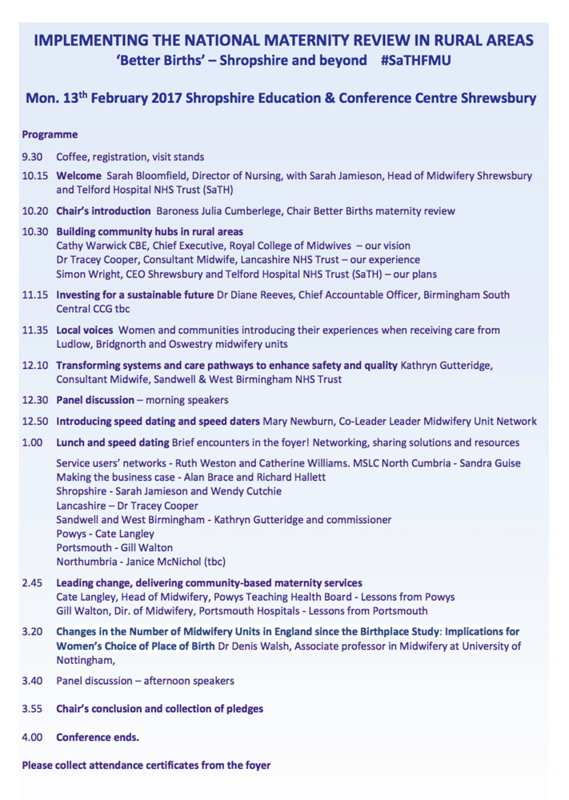 The Midwifery Unit Network (MUNet) was delighted to support Shrewsbury and Telford Hospital NHS Trust (SaTH) along with the Royal College of Midwives in organising a conference in February 2017. The programme, videos of presentations, and links for several of the PowerPoint presentations from the day are available below. 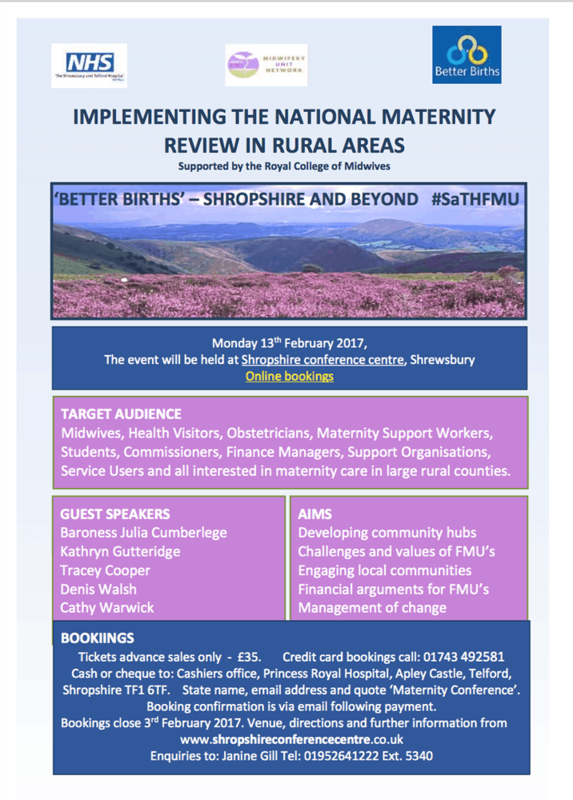 The focus was midwifery units and ‘community hubs’ as referred to in the National Maternity Review for England, Better Births, with a particular emphasis on freestanding midwifery units and maternity services in rural areas. It was a ‘community conference’ with the voices of many local women included, together with a superb line-up of speakers. The delegate fee was kept very low so that as many midwives, students, community groups, women and family members could attend, as well as clinical directors, obstetricians, consultant midwives, managers, commissioners, academics and journalists. The event was a huge success. Highlights included local and national media interest, research release demonstrating a national increase in midwife unit births, midwifery managers and consultant midwives sharing their journeys to set goals to develop their local services; local service users’ stories of midwifery compassion in the MLU’s, which reduced us to tears; commissioners and campaigners who discussed the importance of public health or economic arguments for continuing free-standing unit births and post natal stays across large rural counties. MUNet also launched a ‘how-to’ guide to supporting local midwifery led units. Evaluations received were phenomenally supportive of the conference, with requests for repeat events around the country in the future. We pledged to continue sharing, assisting with future events country-wide, working together and bravely campaigning to ensure that we retain these precious rural resources for geographically dispersed women in times of dire fiscal constraints, in order to implement Better Births, improve continuity and to work with women for women, now and into the future. Below are the video clips of the presentations of the speakers, beautifully filmed by SaTHs medical photographer, Ian Roth.